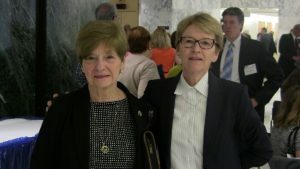 Susan Constantino (left), President & CEO of CP of NYS, and Assemblymember Aileen Gunther, Chair of the Assembly Mental Health Committee, discussed the need to increase the wages of direct care professionals at Lobby Day 2017. The Coalition of Provider Associations is made up of five organizations, representing hundreds of non-profit providers all across the state. The group is made up of: Alliance of Long Island Agencies, Inc., Cerebral Palsy Associations of New York State, Developmental Disabilities Alliance of WNY, InterAgency Council of Developmental Disabilities, Inc., and NY Association of Emerging and Multicultural Providers, Inc. With 48 chapters across New York State, NYSARC supports more than 60,000 people with disabilities. 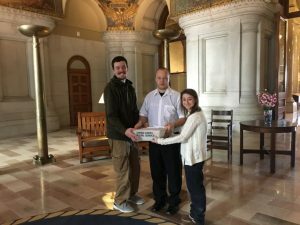 On February 14, representatives of the bFair2DirectCare Campaign delivered chocolate hearts to Governor Cuomo in the hopes he would “open his heart” to the plight of workers who care for New Yorkers with developmental disabilities and fund a living wage for these dedicated professionals. The coalition is asking Governor Cuomo to add $45 million to the NYS budget to begin to provide a living wage for direct support professionals who support New Yorkers with developmental disabilities. The $45 million amounts to 0.0288 percent of the total state budget and would help alleviate a worsening staffing crisis at non-profits that support people with developmental disabilities. This initial investment by NYS would begin the process of paying direct care workers a living wage, which would average $15.50 to $17.50 an hour. The plan calls for adding $45 million to the NYS budget for each of the next six years. 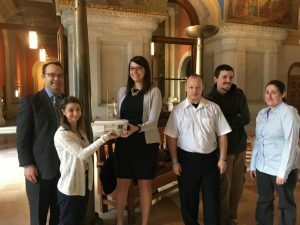 Representatives from CP of NYS Affiliate AccessCNY were joined by CP of NYS Vice President, Government Relations Barbara Crosier as they presented constituent letters to NYS Assemblymember Gary D. Finch in his Albany Office. 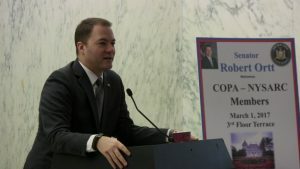 The group also delivered more than 500 letters to Governor Andrew Cuomo’s Office before participating in a news conference in Albany with several other legislators from around the state. The letters, and the news conference, called on Governor Cuomo and the NYS Legislators to add $45 million to the NYS Budget to begin to raise the wages of direct care workers and other low-wage employees at non-profit organizations that provide support and services for people with developmental disabilities. 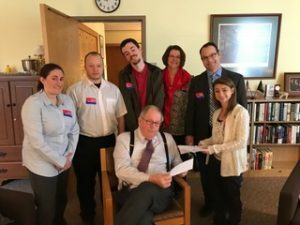 The Albany visit was part of the #bFair2DirectCare effort, a year-long, statewide campaign to convince New York State to provide the funding necessary to head off a staffing crisis at non-profit organizations across the state. A first of its kind Human Resources Professionals Conference for the Disability Provider Community will be held on June 20, 2017 at the Saratoga Hilton Hotel in Saratoga Springs. The conference, sponsored by the Coalition of Provider Associations (COPA), will bring together human resources and other administrative professionals from across the State to share best practices and engage with other professionals for targeted learning and discussion on key issues unique to our field. Changes to the minimum wage and the Affordable Care Act and other challenges are hitting the disability provider community hard. Agencies that provide supports and programs to people with disabilities serve the most vulnerable New Yorkers. Issues with recruitment and retention, our inability to provide competitive wages, and the impact the Justice Center has had on our staff have created a crisis in the field. Attendance and participation in this event will help agencies that serve people with disabilities to be better prepared to face current and future human resource issues. We will soon have additional information about speakers and topics, but right now, please be sure to mark your calendars! Check our website (www.copanys.org) often for updated information. A Gala at the New York Hilton on Thursday, March 9th honored United Cerebral Palsy of New York City’s 70-year history of providing support and services for people with disabilities. The event was also an opportunity for the organization to announce it was changing its name to ADAPT Community Network. 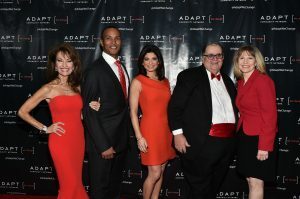 Ed Matthews (2nd from right) is joined by Susan Lucci (Emmy award winning actress from All My Children), Gala Co-Host Mike Woods, Meteorologist on Fox 5’s Good Day New York, Gala Co-Host Tamsen Fadal, Eight-time Emmy Winning Anchor, PIX 11 News, and Donna Hanover, former First Lady of New York City. For over 70 years, ADAPT Community Network has created a more inclusive world for New York City children and adults with a variety of challenges. ADAPT Community Network offers education, health, technology, residential and recreational services and programs for thousands of individuals and families. Like other CP of NYS Affiliates, ADAPT Community Network has expanded, adapted and changed in recent years to respond to challenges created by reductions in government funding and increased scrutiny and regulations. The organization has always prided itself on being a pioneer in providing programs and services that improve the quality of life for people with disabilities. ADAPT Community Network now includes New York League for Early Learning and Human First and has also established an association with Partners Health Plan, a first-of-its-kind non-profit managed care program for people with developmental disabilities in New York. For more information or to learn more about the new direction for the organization visit their website at www.ADAPTcommunitynetwork.org. Governor Cuomo has announced a $19.5 million Community Health Care Revolving Capital Fund intended to deliver low-cost loans to health care providers across the state for capital projects that will improve access to care for all New Yorkers. The revolving loan fund is designed to improve access to capital for clinics and other organizations that are seeking to broaden access to primary care services. It will provide affordable and flexible loans to groups often unable to obtain or afford commercial financing. The Primary Care Development Corporation will administer the fund and will select recipients through an application process. Eligible projects may include construction, renovation, expansion and upgrading costs. The funds may also be used for credit enhancement and loan and debt service reserves to allow a facility to stimulate greater private sector investment. For more information, visit PCDC’s website. The “Growing Tennis Together Grant” is available to United States Tennis Association (USTA) Member Organizations who will demonstrate significant tennis participation growth. Priority will be given to grant proposals which target youth initiatives, schools, diversity and inclusion, and innovative programming. There are two deadlines for this grant – the first is March 17, 2017, the second is July 21, 2017. You can become a USTA member for $35 a year and complete the application quickly online at http://membership.usta.com/section/Organizational-Memberships/122.uts. Once you are a USTA member, click here for the grant application: 2017 Growing Tennis Together Grant. Some CP of NYS Affiliates have received grants in the past. Please contact Jenny Irwin at the USTA with any questions regarding membership or grants. 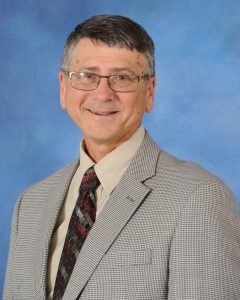 After 25 years at CP of NYS Affiliate Able2 in Chemung County, Mark Peters has announced his retirement as Able2’s Executive Director effective July 1. The organization’s board of directors has selected Leisa Alger, the agency’s current associate executive director, to succeed Mr. Peters as executive director. Mark Peters joined Able2 as associate executive director when the organization was known as United Cerebral Palsy and Handicapped Children’s Association of Chemung County. Among his responsibilities in that position he oversaw the development and operation of a new diagnostic and treatment center which opened in early 1993. 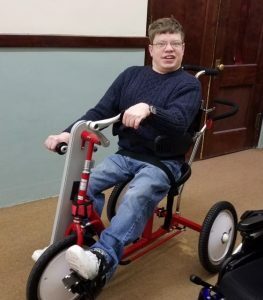 Prior to joining Able2, Mr. Peters served as the executive director for Rehabilitation Services Inc., a Binghamton based not-for-profit organization that provided rehabilitation therapies to preschool and early intervention programs. Ms. Alger started at Able2 in 1999 as director of staff development & clinical services. Her responsibilities at the time included directing, evaluating, and modifying an agency-wide staff development program, while also supervising the organization’s service delivery system for the residential and day program adult population. CP of NYS Affiliate Ability Partners, Inc. has been named a semifinalist for the 2017 Collaboration Prize, a national award designed to highlight exceptional permanent models of collaboration among nonprofit organizations. Ability Partners was chosen one of 18 semifinalists from more than 350 submissions. The selection of Ability Partners, Inc. is in recognition of the extraordinary collaborative affiliation between CP Rochester, Happiness House and Rochester Rehabilitation. A selection committee will select eight finalists from among the 18 semifinalists. Judges will identify eight collaborations that exemplify the impact of working together on a permanent basis. The finalists will each receive $10,000. The grand prize winner of an additional $150,000 will be announced in April. For a full list of semifinalists, please visit www.thecollaborationprize.org. Derek looks awesome on his new 3 wheeled bike. What’s even more exciting is that Derek helped build his own bike with help from Robert, his Day Hab Aide, and Spoke folk. Aspire proudly partners with Spoke folk in Dunkirk. Spoke folk’s mission is to ensure that other young people can experience that same special feeling that comes with having a bike of their own. Spoke Folk is committed to the goal of making sure that “every kid deserves a bike” — regardless of age or disability. Learn more about Spoke Folk at http://www.spokefolk.net/. Watch our website for details!